In May 2009, the 89-year-old John Demjanjuk was deported from the United States to Germany, where he was arrested and charged with aiding and abetting murder in at least 27,900 cases. These murders were allegedly perpetrated at the Sobibór camp in eastern Poland. According to mainstream historiography 170,000 to 250,000 Jews were exterminated here in gas chambers between May 1942 and October 1943. The corpses were buried in mass graves and later incinerated on an open-air pyre. But do these claims really stand up to scrutiny? In this book, the official version of what transpired at Sobibór is put under the scanner. It is shown that the historiography of the camp is not based on solid evidence, but on the selective use of eye-witness testimonies, which in turn are riddled with contradictions and outright absurdities. 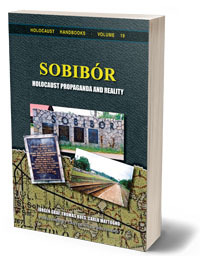 For more than half a century Holocaust historians made no attempts to muster material evidence for their claims about Sobibór. Only in 2000-2001 did Professor Andrzej Kola carry out an archeological survey at the former camp site. His findings are here presented in detail and revealed to have fatal implications for the extermination camp hypothesis. Also scrutinized is the basis of the mass gassing allegations, namely the alleged National Socialist policy of extermination against the Jews. A large number of contemporary documents are brought forth which refute the Holocaust historians’ claim that the “Final solution” and “deportation to the east” were code words for mass murder. What emerges from the analysis is the picture of Sobibór not as a “pure extermination camp”, but as a transit camp from where Jews were deported to the occupied eastern territories. reprint of 1st edition, 442 pages. Format: pb, 6"×9", 22 illustrations, bibliography, index.